Follow our Journey to Kazan for the World’s Largest Skills Competition! 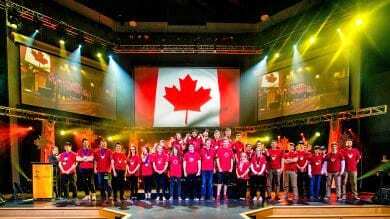 Every two years, the WorldSkills Competition represents the best of international excellence in skilled trades and technologies. 2019 will mark the first time that Russia is hosting the WorldSkills Competition. On August 22-27, 2019, young competitors from around the globe will gather at the Kazan Expo International Exhibition Centre for the 45thWorldSkills Competition, with the goal of earning the title of world champion in their skill area. These competitors represent the best of their peers and have earned a spot on their country’s team through dedication and hard work. At the WorldSkills Competition, competitors will participate in simulated real work challenges, and will be judged against international quality standards. The event slogan is “Skills for the Future”, which is also the official Competition hashtag: #skillsforthefuture. 🔶Kazan, the host city of WorldSkills Kazan 2019, is the capital of one of the Russian regions, Tatarstan. In 2009 Kazan has gained the name «Third capital of Russia».